If you don’t want to pay Samsung and Apple and iGoogle nearly four figures for their latest flagships, but still want to get a solid smartphone, the fourth generation of the Moto X is rolling out for $400. 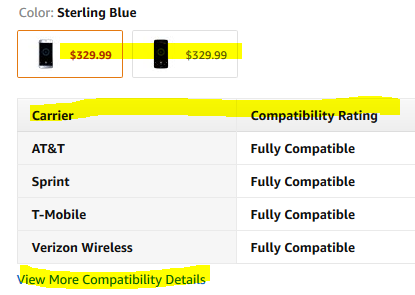 But if you are a Prime member and don’t object to seeing Lockscreen Offers and Ads, Amazon is offering this model for $70 less, you can get the Lenovorola Moto X4 for $330 in either color scheme. Limit one per color per customer. It will come out October 26 (2017). This is an all-carrier phone, it works with all four major US carriers (AT&T, T-Mobile, Sprint, Verizon), which will likely (other things equal) help with its resale value as long as most phones sold are not all-carrier phones. Of photography interest, it has dual rear cameras and microSD slot and IP68 water resistant. With 3GB RAM and Snapdragon 630 and 32GB on-board and 5.2″ 1080p screen.